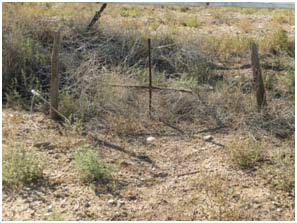 A local newspaper reported that Mrs. Coury was present and made an attempt to wrestle with the murderer and in the struggle, was shot above her hip. It was later determined that the metal stay in her corset had deflected the bullet and saved her life. Her son Freddie became her hero when he peppered the assailants with canned goods when their last attempt to shoot was aborted by a jammed pistol. They fled the scene. During the interrogation by the sheriff, Miranda was fingered as the shooter and the one who had planned the hold-up. He had a long criminal history including time served in the State Penitentiary for murder and forgery. His freedom was gaine when he was given a pardon by Governor Larrazolo during his last days in office. At their trial in June, all four defendants were convicted of murder. 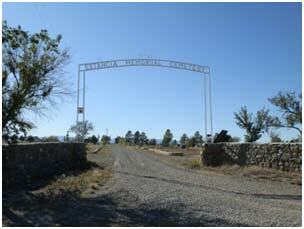 Miranda, Rentería and Medrano were hung as the sun rose on July 28, 1922 in the Town of Estancia. Hundreds of people assembled to watch but the gallows platform had been draped by a tarp to shield the event from view. However, the rising sun shone on the tarp giving spectators a silhouetted outline of the defendants against the tarp. 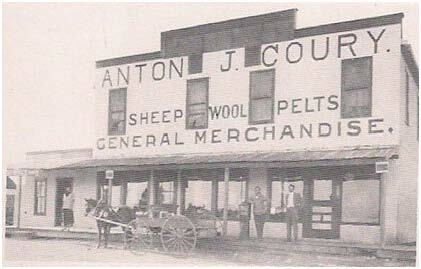 The Coury store in Duran, NM. 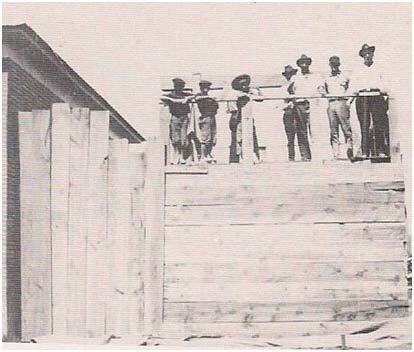 The gallows prior to the hanging in 1922.